It’s customary to do year-end reviews. 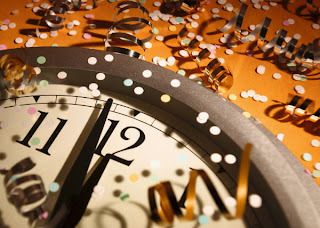 I only started seriously on this blog in July, so it can’t be a full year. Nevertheless, I’ve combed through my posts, and this is what I’ve come up with. The languages involved: American Sign Language, Arabic, Aramaic, Chinese, Douala, English, English Pidgin, Ethiopic, French, French Pidgin, Gaelic, German, Greek, Hebrew, Hindi, Italian, Japanese, Kafiri, Latin, Latvian, Polish, Pushtu, Russian, Spanish, Syriac, Urdu, and Valencian. The places where they were used: Abu Dhabi, Afghanistan, Britain, Bulgaria, Cameroon, Canada, Chile, China, Denmark, France, Germany, Holland, India, Iraq, Israel, Italy, Latvia, Mexico, Norway, Pakistan, Poland, Singapore, Spain, Switzerland, Taiwan, USA, USSR and Zambia. The time periods: in Antiquity; and in the present era, the 1st, 4th, 9th, 16th, 17th, 18th, 19th, 20th, and 21st centuries. The types of texts to which they were applied: blogs, folklore, journalism, literature, mangas, music lyrics, religious, scientific, terminological, theatrical, videos. The types of interpreting: business, church, court, diplomatic, family, liaison, military. And the types of translators: individual, collective, communal, computers, fansubbers, language brokers, revisers; Natural (with no training and minimal exposure), Native (with no training but self-taught by example and experience), Expert (trained and accredited), Professional (for money). If any of these has particularly marked the year that’s ending, I think it’s crowdsourcing (see posts of July 14 and December 19), the spread of which has been made possible by new technology but with the translating as dependent as ever on humans. Minako O'Hagan. Evolution of user-generated translation: fansubs, translation hacking and crowdsourcing. Journal of Internationalisation and Localisation, vol. 1, no. 1, 2009, pp. 94ff. And especially to my band of faithful Followers! I’m going to take a break now until the New Year. This post is the conclusion of the two preceding posts. Please read the other ones first. My own first contact with the Nights came about when I was barely six years old; and not from the print version, not even from an adaptation for children, nor from Disney - after my time! - but from a peculiarly English theatrical institution, the Christmas pantomime. I was taken to see Aladdin and his Magic Lamp. Though it began in the 19th century and had affinities with the music hall, live performances of ‘panto’ are still going strong for a few weeks each year in theatres all over Britain, even with the competition from the other media. So what is it? Traditionally performed at Christmas, with family audiences consisting mainly of children and parents, British pantomime is now a popular form of theatre, incorporating song, dance, buffoonery, slapstick, cross-dressing, in-jokes, audience participation, and mild sexual innuendo. There are a number of traditional story-lines, and there is also a fairly well-defined set of performance conventions… along with a… 'guest celebrity' tradition, which emerged in the late 19th century. One of the “traditional story lines” is Aladdin. The “performance conventions” require that Aladdin be played by a woman showing off shapely legs; and that his mother, named the Widow Twankey (or Twanky), be played by a man in drag, a so-called pantomime dame. But the outline of the original story is retained, as are the Chinese location, the Sorcerer, and of course the Genie (Arabic jinniy) of the Lamp. As for the "guest celebrities", the one who’s made the headlines this year is Pamela Anderson, a star of the American TV series Baywatch. She’s playing this week in the panto at the New Wimbledon Theatre in a suburb of London. Surprisingly, considering that she’s famous for her curvaceous body, she’s not playing the title role but the Genie of the Lamp. That’s a new twist. And that’s how a personage with a thoroughly Muslim Arabic name (it means Ennobled of the Faith) and etymology - even the double dd in the middle is a vestige of Arabic - came to figure among the thoroughly British English icons of Christmas. From one folklore to another, a remarkable story of popular cultural transfer through translation and intersemiotic adaptation. The changes are great, the new audience is unaware even of the existence of the original one, yet the essence of the story and the spirit of fantasy and ribaldry are preserved. 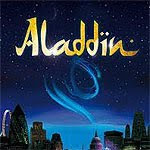 The image is from a poster for this year’s New Wimbledon Theatre pantomime production of Aladdin. Note the hint of Arabic calligraphy in the style of the lettering and the two dots on the i. There are articles on Pantomime and on Aladdin in Wikipedia. This post is a continuation of the preceding post. Please read the other one first. It’s amazing how, in the 18th century, best-sellers were translated as fast as Harry Potter novels are today if the publishers sensed there was a market for them in another country; and unlike J. K. Rowling, Galland enjoyed no protection under international copyright. The earliest English translation in the British Library catalogue dates from 1712-1715, that is to say even before the publication of the original had been completed in Paris - and it was the fourth edition! It was an anonymous translation, probably the work of one or more of the notorious ‘Grub Street hacks’, who were poor, aspiring professional writers and eager translators who lived and worked in Grub Street in the City of London. One remarkable thing about this very first English translation is the title: The Arabian Nights Entertainments. It was not, like Galland’s Mille et une nuits, a literal translation from the Arabic but one that adopted an English viewpoint and enticed readers by making the book sound both more exotic and more like light reading. Thereafter it became the standard English title. It was the first step in the process of naturalization. 1. The full and for the most part accurate translations by Arabists for adult readers. One of these was by the great Arabic lexicographer Edward Lane, who had the additional advantage of having lived for several years in the Middle East. It was for a long time the most popular and it is still in print. However, even a scholar like Lane came up against a serious social constraint. The original Nights are quite ribald, and public taste and mores in Victorian England would not tolerate their publication without ’bowdlerisation’, that is to say the expurgation or toning-down of sexual allusions and jokes. Galland had been constrained to make the same compromises for 18th-century France. The result was, to a mild degree, what the French call belles infidèles (beautiful but unfaithful). The omissions were eventually restored with a vengeance later in the 19th century by the version (in very quirky English) of Sir Richard Burton, but only by publishing it as an edition restricted to private subscribers. 2. Innumerable derivatives in the form of abridgements, versions for children or 'for family reading', and ‘imitations‘, that is to say newly invented stories in the same genre. There‘s nothing wrong with that; the Nights never were an untouchable classic. Galland himself collected and incorporated stories that were not in his source manuscript. Many of the derivatives are individual stories extracted from the collection. Of these last, the most popular have been the tales of Sinbad the Sailor, Ali Baba and the Forty Thieves, and Aladdin and his Magic Lamp. 3. Derivatives in other media: stage and even musical adaptations from early on, but above all the work of many famous book illustrators, for example Aubrey Beardsley (1872-1898, an admirer of Burton - see image) and Arthur Rackham (1867-1939, in the ‘fairy story‘ tradition). (The Galland was illustrated by Gustave Doré.) Then, in the 20th century, came the film versions, culminating in the Disney animated Aladdin. Ah, for that - if you haven’t already guessed the answer - you must be forbearing for one night more and read the concluding post tomorrow. The Arabian Nights Entertainments: consisting of one thousand and one stories... Translated into French from the Arabian mss. by M. Galland ... and now done into English. The fourth edition. vol. 1-6. London: Andrew Bell, 1712-1715. Grub Street is still there on the maps of London, but it’s now called Milton Street. The Thousand and One Nights Commonly Called, in England, The Arabian Nights' Entertainments. A new translation from the Arabic with copious notes. By Edward William Lane. With six hundred woodcuts by William Harvey. London: Murray, 1839. An American edition of 1848 “for family reading“ can be read on Google Books. Bowdlerize comes from the name of Dr. Thomas Bowdler, who published an expurgated edition of Shakespeare. A plain and literal translation of the Arabian Nights' Entertainments, Now Entituled [sic] The Book of The Thousand Nights and a Night. With Introduction, Explanatory Notes on the Manners and Customs of Moslem Men and a Terminal Essay upon the History of The Nights by Richard F. Burton [1821-1890]. Benares: Kamashastra Society, 1885-8, 10 vols. Reissued in London "Printed by the Burton Society for private subscribers only." The original is a very expensive collectors’ item, but there’s a facsimile at http://burtoniana.org. Burton’s admiring but more circumspect wife published a bowdlerised version of it. Disney's Aladdin. Adapted by Don Ferguson. New York: Mouse Works, 1993. Between 1704 and 1717, there occurred one of the Great Events in the history of European translation. This was the publication of Antoine Galland’s French translation from Arabic of The Thousand and One Nights, in 11 volumes. It was the first version in any European language of one of the most captivating of all collections of folk tales. They deserve to be on the UNESCO list of Intangible Cultural Heritage. It was by no means the first translation from Arabic to French, but it was the first to become a best-seller. The ground had been prepared for the publication. The taste for fantasy folktales had been stimulated in France - and perhaps in Galland - by the publication, just a few years earlier, of Charles Perrault’s Tales of Mother Goose. However, the fantasies of the Nights took not only France but all of literary Europe by storm. As my one-time university tutor, Bernard Lewis, has said, they were “the fountainhead of the new romantic cult of the East," or in other words what is nowadays called Orientalism. What kind of translator was Antoine Galland (1646-1714)? Certainly a Professional Expert, by the criteria of his century. The Greek, Latin and Hebrew he learnt at school were commonplace then (see my December 2 post about grammar schools, which had their equivalent in France), but he went on to master all the three major languages of the Middle East in his time: Arabic, Persian and Turkish. He became librarian and private secretary to the nobleman who was French ambassador in Constantinople (now Istanbul) and accompanied him on the latter’s journeys through Syria, Palestine and the Balkans. His liaison work for his patron must therefore have involved him in a good deal of translating and interpreting. But beyond that, he was a bibliophile, a collector and an antiquarian. Indeed Galland deserves a lot of credit not only for translating the Nights, but for finding them and bringing them to light. You see, they were popular, orally transmitted stuff, with constantly shifting and augmented content, and consequently not considered ’literature’ by the Arabs or by their successors the Ottoman Turks. Even two centuries later, when I was studying Classical Arabic at university, they weren’t on our reading list - which was a pity because their simple language, direct narrative style and entertaining content makes them an excellent text for beginners. Today there are critical editions by Arabs, and conferences about them. But the Arabs’ regard for the Nights today is the consequence of the Europeans’ esteem for them thanks, in the first place, to Galland. I can’t follow the spread of the Nights all through Europe. Anyway, there’s a very good book that does so, Mia Gerhardt’s The Art of Story-Telling. Instead, I’m going to stick what ensued in England. To be continued tomorrow - as Sheherazade might have said. Antoine Galland (1646-1714). Les mille et une nuits: contes arabes / trad. en françois par Mr Galland. Paris: Veuve de C. Barbin, 1704-17. 11 vols. There are modern editions still in print. Charles Perrault (1628-1703). Contes de ma mère Loye. Paris: C. Barbin, 1697. 273 p. There are modern editions and English translations still in print. Notice that Perrault and Galland had the same publisher. Bernard Lewis. Islam in History: Ideas, Men and Events in the Middle East. London: Alcove, 1973. The paperback edition is still in print. Mia I. Gerhardt. The Art of Story-Telling: A literary study of the Thousand and One Nights. Leiden: Brill, 1963. Has a pretty full list of European translations. A pity it’s gone out of print. Ed Lake. Nights to remember. The National newspaper, Abu Dhabi, 2009. Click for link. Crowdsourcing has been mentioned on this blog before. Applied to translating it means ‘outsourcing’ a translation, usually in chunks, to a community of Native Translators. One of its manifestations is fansubbing, which was mentioned on September 28. And on July 14, I described a large Chinese collective translation network called Yeeyan. Plurk has won market share in Asia with the help of users around the world willing to translate it into dozens of languages outside of its main lingo, English… When Plurk first launched, we had a translation system where the whole system was translated into 25 different languages in two weeks. It's all done by our users. We have some difficult languages, like Gaelic, Arabic, and Japanese, and it's all done by our users. That gave us a head start, especially in a place like Taiwan. I think it's different here than in Hong Kong or Singapore. People don't speak English here as well, so when they come to Plurk and they see a traditional Chinese interface, they will be like, ‘Wow, this is done by a Taiwanese company.’ There is this kind of connection between the service provider and the user. We have users in Zambia, Denmark, Norway and other places, too… When we launched, some Plurkers from a faraway country said, ‘Hey, can we translate that for you?’ And we said sure, why not. Then, it just turned viral. It's kind of interesting to see how passionate people are about the service. They really want people in their own country to use Plurk. This is all volunteer work, but we do have this kind of reward system in place where you get a badge for everything you accomplish. If you become a translator, you get a Rosetta Stone badge, stuff like that. People are gratified by stuff like that… Now we have groups of translators all over the world. When we write a new feature we will put it all out in text and push it through the system, then all the translators will take them. So all these translators will get an e-mail saying, ‘Hey, there's a new string, please help us translate it.’ It's very democratic. Say you have maybe 10 Taiwanese translators translating a string but they get to vote among them for the best translation and then the system will push the best one up to the live Web page. So we push things out, then they translate it, then they push it in… It's kind of interesting. I think the users appreciate that, in the long run. Once you set up the translation system, it's not that hard to do. I think every social-networking site should try to do that. If you only implement an English user interface, you shut out a lot of users. So Plurk uses crowdsourcing not only to do the translations but also to evaluate them. The ability to assess translations, including one’s own, is an important aspect of Natural, Native and indeed all translating. If you can’t compare a translation with its original, how can you be sure it’s right, or at least nearly right? The ability starts in children, so it’s not surprising that the Plurk translators have it. Dan Nystedt (IDG News Service). 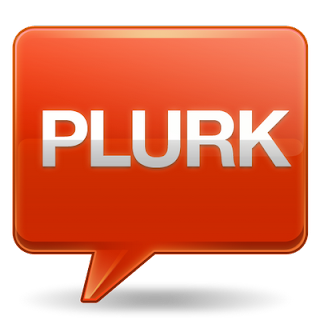 Plurk Users Bring Microblogging to Many Languages. PCWorld, 2009. Now for some light relief from semiotics and all that. Georgetown, PEI, native Peter Llewellyn made the initial connection between PEI beef farmers and Japanese businesses who are looking at raising a special Japanese beef cattle breed on PEI [PEI stands for Prince Edward Island, a small, charming province on the Canadian Atlantic coast]… PEI farmers looking to sell Wagyu hope for some help from a home-town heroine… Enterprising farmers on PEI are hoping to crack Japan's stiffly competitive Wagyu beef market by using the lure of Anne Shirley, a revered figure to generations of Japanese women – the ones who decide what is served at weddings. When foreign fiction in translation is appropriated by the advertising industry, you can be sure it’s entered the popular culture of the receiving country. Oliver Moore. A new job for Anne of Green Gables: selling beef to Japan. Globe and Mail, December 8, 2009. Lucy Maud Montgomery. Anne of Green Gables. Boston, 1908. Green Gables is the name of the house where Anne is brought up in the story. 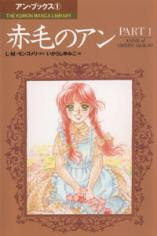 Akage No Anne [Red-haired Anne]. Translated by a well-known translator, Hanako Muraoka, in 1939 from a copy belonging to a Canadian missionary, but not published until after World War II. The image above is from a manga version. The text of the manga has been scanlated by fans (see September 28 post). This post is the conclusion of the two preceding ones, which should be read first. One of the sections of Alexander Ludskanov’s magnum opus that Bruno Osimo has preserved in his Italian recension is, fortunately, 3.2.1 L’informazione traduttiva necessaria (The Information Needed for Translating). It was the subject of my last discussion with A.L. in Ottawa not long before he died. I dwell on it here because it’s a matter that’s fundamental to all translating, whether machine, expert or natural. Only a layman thinks that a good knowledge of the two languages involved is enough information. For example, even if you know the verbs, the pronouns, the sentence forms, you can’t even translate appropriately such a simple message as “How are you?” into French, Spanish, etc., without also being informed what the social relationship is between the speaker and the hearer: Comment allez-vous? or Comment vas-tu? The term A.L. uses for such information is extralinguistic. A.L. was acutely aware that the acquisition and incorporation of extralinguistic information presented a major problem for machine translation (MT). A few years before, in 1962, the Israeli logician and linguist Yehoshua Bar-Hillel (see photo), who was engaged in machine translation research at MIT, had declared it to be an insurmountable obstacle to the realization of what he called Fully Automatic High Quality Machine Translation. His pessimism put a damper on MT research in the United States. One of his examples was the apparently simple phrase slow neutrons and protons. In order to translate it correctly into languages that require agreement between nouns and their adjectives, it must be parsed either as (slow neutrons) + protons or as slow (neutrons + protons). But the choice between them depends on prior knowledge of, or newly acquired information about, nuclear physics. To A.L., as a semiotician, the extralinguistic information did not come directly from the world outside the translator (the ‘real world’) but from what was coded in other sign systems in the translator’s mind. On the other hand, it’s not necessary, for the translation of a given text, that the translator possess, or have access to, the whole vast ocean of human knowledge. Each translation requires only a few drops from the ocean, and that, perhaps, might be acquirable and could be processed by a computer. Generally speaking, the more narrowly specialized the source text is, the less of the ocean is needed. But how to determine and specify precisely what information is required? That’s what we saw as the primary problem of l’informazione traduttiva necessaria. Yehosua Bar-Hillel (1915-1975). The future of Machine Translation. Times Literary Supplement, April 20, 1962. Bar-Hillel called extralinguistic information encyclopedic information. He later recanted in part and admitted that perhaps MT didn’t need to be High Quality or Fully Automatic. There’s an article on him in Wikipedia, which also tells us that his granddaughter, Gili Bar-Hillel, is the Hebrew translator of the Harry Potter series. This post is a continuation of the preceding one. Please read the other one first. 1. There was no English translation. Contrary to what some people might think, translation studies specialists are as dependent on translations as other people. 2. There was an excellent German translation, but it was made and published in East Germany when Europe was still divided. The French translation was in A.L.’s own imperfect French - and you know how picky the French are about their language; furthermore it was execrably printed. Even in intellectual spheres, appearances do count. 3. As time wore on, the parts of the book that had to do with computing went further and further out of date. A.L. foresaw this, and told me that future translators would have to update it. And then, around 1990, research on machine translation took a whole new direction. 4. Interest in the connections between translation and semiotics became focussed on literary and cultural semiotics, which were not A.L.‘s interest. But now A.L.’s book and its ideas have been given new life. After the long neglect, an Italian translation has unexpectedly appeared. It was done from the French version by a team, and edited by Bruno Osimo, an enterprising and discerning teacher of translation and translation theory at the University of Milan and elsewhere in Italy (more about him at www.logosdictionary.org/corso_traduzione/bosimo.html). This is not a complete and unabridged translation of the 1967 work, which had 160 pages. Some chapters that were all about machine translation have been left out entirely… The other chapters have undergone editing so as to remove the technicalities of the most ’cybernetic’ aspects of the book; they would not mean much today to people who are interested in translation. [Cybernetic, in A.L.’s usage, conformed to the East European concept that computer science was a branch of cybernetics.] Altogether, the text has been reduced by about two fifths. The original Bulgarian contained a great many [quasi-mathematical] symbols and formulae. Here such abbreviations, etc., have been eliminated in order to make the text more readable. Gone too are the many footnotes, and with them the passage about ‘intuitive’ translators that I cited at the beginning of the preceding post. Never mind. The essential Ludskanov is there. It’s good to see the book in print again and made available to another generation. Perhaps somebody will be guided by Osimo’s editing to finally produce an English version. The book is nicely printed, and at 10 euros it’s a bargain. Aleksandar Lûdskanov. Un approccio semiotico alla traduzione. 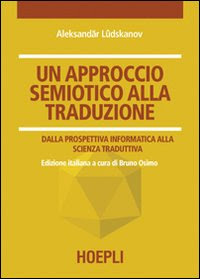 Dalla prospettiva informatica alla scienza traduttiva. Italian translation by Vanessa Albertocchi, Gaia d'Alò, Emilia de Candia, Francesca Picerno, Luca Revelant, Valeria Sanguinetti, Elisa Scarmagnani and Maura Zampieri from the French translation. Edited by Bruno Osimo. Milan: Hoepli, 2008. xix, 76 p.
Aleksander Lyudskanov. Prevezhdat chovekt i machinata. Revised and expanded edition, edited by Elena Paskaleva, with a preface by the eminent Bulgarian linguist Miroslav Yanakiev. Sofia: Narodna Kultura, 1980. Elena Paskaleva. Alexander Ljudskanov. In W. J. Hutchins (ed. ), Early Years in Machine Translation: Memoirs and Biographies of Pioneers, Amsterdam, Benjamins, 2000. pp. 361-376. For fast reading, go to http://books.google.com/books?id=CsPYkBRva1gC&pg=PA361&lpg=PA361&dq=ljudskanov&source=bl&ots=UyDck2F0OR&sig=HapR9t19kuWf_7AN-jePQuyKdOE&hl=es&ei=74obS_-3LdCu4QabzuHgAg&sa=X&oi=book_result&ct=result&resnum=5&ved=0CBwQ6AEwBA#v=onepage&q=ljudskanov&f=false, although there are a few pages missing. Alexander Ljudskanov. Mensch und Maschine als Übersetzer. German translation by Gert Jäger and Hilmar Walter of the Karl-Marx University, Leipzig, from a greatly expanded source text. Halle: Niemeyer, 1972 / Munich: Hueber, 1973. 260 p. A.L. much preferred this translation to his own French one. There's also a Polish translation. Osimo says he couldn't trace it, but it's in the catalogue of the National Library of Poland. Grâce à une certaine intuition et à une certaine habitude, chaque sujet bilingue traduit d'une manière ou d'une autre. Par conséquent, la science de la TO [traduction humaine] n'avait pas à s'occuper de la question comment apprendre à l'homme à traduire, mais de la question comment lui apprendre à agir d'une manière ou d'une autre pour obtenir des résultats correspondant à certains critères acceptés a priori. By intuition and habit, all bilingual people can translate in some way or other. Consequently the fundamental question for the study of human translation is not how to teach people to translate, but how to teach them to behave in a way that will produce results conforming to certain well-established, accepted criteria. He couldn’t have said it better; but does that mean he was an early proponent of research on NT? Not at all. First, if you re-read his second sentence, you’ll see that what he recommends is not the study of the spontaneous phenomenon, but of how natural translators can be trained to translate according to the norms of their society. Secondly, the passage I’ve quoted only occurs in a footnote. He certainly knew what he was saying, but the fact that he didn’t put it in the body of his text means, IMHO, that like several other early discoverers of NT, he didn’t appreciate its full significance. Never mind. He clearly saw that NT exists and that it’s universal. There are a number of other interesting ideas in his book, but they aren’t directly relevant to this blog. What does it mean, however, to say that he was a semiotician? Semoticians study all kinds of sign systems (N.B. not just signs, but systems of signs). For them, languages are one kind of sign system, and there are others just as important. What would be such another? The genetic code, for example. For semioticians, therefore, a language translation is a conversion (or a series of conversions) of information-bearing signs, just as the transformation of DNA into RNA into protein is. (In this connection, see my July 25 post.) Semioticians think, as A.L. would have put it, “at a higher level of abstraction” than linguists. Ludskanov, Ljudskanov, etc. : These are just variant transliterations of his Bulgarian name. Likewise Alexander, Alexandre, Aleksandar. Aleksander L’udskanov. Prevezhdat chovekt i machinata. Sofia: Nauka i Izkustvo, 1967. 159 p. Published version of his doctoral thesis of 1964. Alexandre Ljudskanov. Traduction humaine et traduction mécanique(Documents de linguistique quantitative 2 and 4). French translation by A.L. himself, Paris, Dunod, 1969, 2 fascicles. There's an article in Wikipedia on the Institute of Mathematics of the Bulgarian Academy of Sciences. Adam Nicolson’s Power and Glory (P&G) gives a mass of information and insight about the Translators. Fortunately for me in my task of analysis, Nicolson ends the book with a section of potted biographies where their education and careers are summarized. The following information is drawn from it. Only very few of the Translators would have been early bilinguals: no doubt Hadrian à Saravia, born in what is now France, of Flemish and Spanish parents; and Richard Thomson, born in Holland of English parents, an “English Dutcheman”. For the rest, their bilingualism would have begun when they went to school. At that point they would have entered the Tudor school system for the upper and middle classes. Either they went to one of the ‘public’ schools, so called because they were open to anybody who could pay the fees, or else to one of the more local ‘grammar schools‘. Both kinds taught Latin and Greek; some also taught Hebrew. The teaching method was the traditional Scholastic approach: to acquire a reading knowledge of foreign languages by studying a grammar and applying this knowledge to the interpretation of texts with the use of a dictionary. P&G gives the names of the schools that eight Translators went through. Besides the language qualifications, seven Translators were professors of Divinity, i.e. theology, an essential field of background knowledge for the work. And finally, there is the consideration that all but one of the Translators were ordained clergymen in the Church of England. As such, they were necessarily well-acquainted with the other English translations of the Bible, earlier or contemporary, and with the heated discussions over them. Some also read Bibles in other European languages. Many such discussions were terminological; they concerned how to translate individual words (Greek ecclesia by church or by congregations, for example). In short the Translators were already well trained in translator disputation. We have established that from their school days the Translators were Native Translators. Can they be categorized as Expert Translators? We can’t apply the criteria of the 21st century to the 17th century. In those days there were no accrediting bodies, no degrees or diplomas in translation, no schools of translation. But the information cited above justifies our granting them an equivalence. It was genuinely for their linguistic and subject expertise and their prior knowledge of translations that they were appointed. Another Expert criterion, one that is still applied, is whether the Translators had other published translations to their name. Some did. Richard Thomson, the English Dutcheman, was notorious for his witty, bawdy translations of Martial’s Epigrams (though I can’t trace that they were actually published). James Montague edited and translated works by James I himself. Were they also Professional Translators? That question too can’t be answered in terms of the 21st century. Just one Translator resigned his university position to work full time on the translation. Generally speaking, the incentive wasn’t money but currying favour with the supervising bishops and with the king himself that could lead to advancement in the hierarchy. No payment in cash is recorded by P&G (except one of 50 pounds), and the reason is simple: James’s predecessor, Queen Elizabeth, had left the King’s exchequer empty. Only the revisers on the General Committee of Review were paid regularly, but by a private sponsor, the Stationers’ Company, a guild to which printers belonged. Fortunately, most of the Translators already had ‘livings’, i.e. a church position with an assured income attached to it. But some did not, and for them provision had to be made, livings had to be provided. A lot of initial effort had to go into pressuring bishops to find livings for that purpose, and we can consider the beneficiaries as professionals for the duration of the work, as we can too the revisers. The rest not. To sum up, the KJV was the work of Expert Translators, whose initiation as Native Translators had begun as soon as they went to school and whose subsequent training was long and of the highest quality. A minority of them were temporary Professionals. James I, King of England. The Workes of the most high and mightie Prince, James ... King of Great Britaine, France and Ireland ... Published by James [Montagu], Bishop of Winton and Deane of his Majesties Chappel Royall. London, 1616. Sir Henry Savile (ed. with the assistance of John Bois et al., Translators). Tou en hagiois patros hêmôn Iôannou archiepiskopou Kônstantinoupoleôs tou Chrysostomou ton heuriskomenon... [Greek text of the writings of St. John Chrysostom, one of the Fathers of the Greek Orthodox Church]. 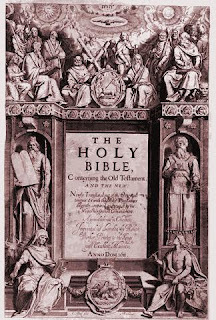 Published at Eton College, probably the most famous of the ‘public’ schools, 1610-1612, 8 vols. Savile was Provost, i.e. Head, of Eton. The tradition of Greek studies continues at Eton today: see The Eton Greek Software Project at http://www.etoncollege.com/GreekProject.aspx?nid=e19484e6-707c-44d4-a3d7-f8b93df8751f. Savile also published a Latin-English translation of part of Tacitus. 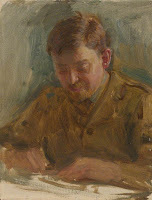 Geoffrey Moorhouse. The making of a monument. The Guardian, May 17, 2003.